You can print your own Penrose kite & dart tiles on card stock for almost no money at all, but playing with them can be more irritating than fun. The pieces seem to want to overlap, and the slightest draft blows laboriously-constructed arrangements awry. Far more entertaining are the Lucite Penrose Kites & Darts sold by Kadon Enterprises, shown here. The thickness and heft of the tiny tiles (one and a quarter inches long on the longer sides) make them a great pleasure to handle. 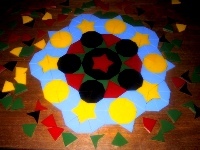 If you order a large set, there is a gameboard for playing what appears to be a quite satisfying game, but there is a lot of fun to be had in solitary play, as well, building creative new layouts, or reproducing one of the named layouts such as the Infinite Star Pattern, the Infinite Sun Pattern, or the Cartwheel pattern ("in some ways the most important Penrose Tiling"), which are nicely illustrated on an interesting page on tilings at the University of Wisconsin. There are many possibilities. This is my favorite of all the tiling toys with which I have had the opportunity to play. Here are a few of the designs we've constructed. The huge variety that is possible makes this more fun than any other tiling toy, in my opinion, and the mathematics of it is extremely interesting, at least if you like that sort of thing. Martin Gardner's book Penrose Tiles to Trapdoor Ciphers makes fascinating reading (an excerpt has been posted online). The five-color design below on the left is the Cartwheel design. Notice how the "spokes" of the wheel, constructed here with blue or black pieces, are made of two different "bowtie" constructions, the longer type near the center, and the shorter type next out. The two types of bow ties alternate outward to infinity. 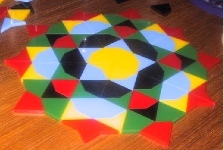 The spaces in between the spokes are constructed here with yellow, green, or red tiles. The red center is a decagon, in this case with the odd figure known as the "batman" figure shown in black in the center. It's a very complicated design to construct, and makes me wish I could have hundreds of dollars' worth of Kites & Darts to keep on expanding it. 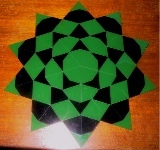 The design made with green and black Kites & Darts, below, is another aperiodic tiling, which has the same center as the Infinite Sun pattern. 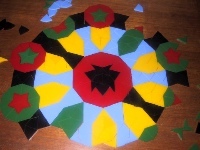 Designs with radial symmetry are aperiodic. 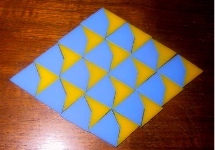 The tiling of blue Kites & yellow Darts, below, is the only one shown here that is periodic, and it is quite obviously so. It's an extremely easy pattern to build. A periodic tiling repeats again and again, with the same design found again whether you shift to the left or right, top or bottom. See also the entries under Tilings for Pentarose (June 16, 2004) and DekaStar (May 24, 2004), which are composed of shapes from Penrose's two other classes of tilings.